During pregnancy, there are several structural, physiological, and hormonal changes that take place in preparation for the development and eventual birth of the baby. 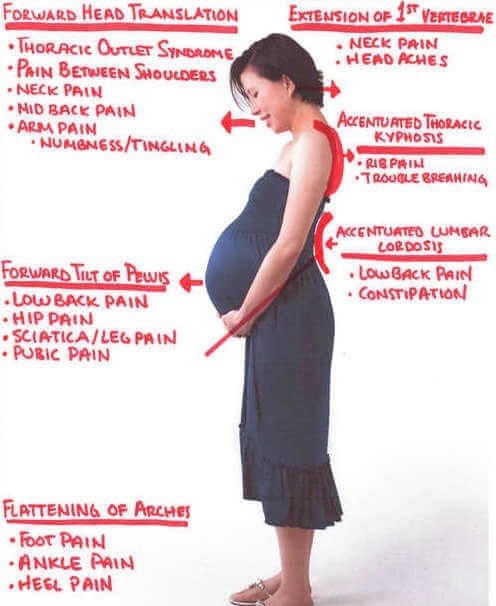 These changes associated with pregnancy are often accompanied by low back pain. Often, low back pain is said to be an unavoidable complication of pregnancy and can lead to a longer duration of the labor and delivery process. Studies show that 75-84% of pregnant patients who received chiropractic care during their pregnancies found relief from pain. This explains why a statistical review reported that women in their first pregnancy who seek chiropractic care throughout gestation have, on average, a 25% shorter labor time. Similarly, women who have had multiple pregnancies that seek chiropractic care throughout their pregnancy have 31% shorter labor times on average. These studies also show that chiropractic treatment may significantly decrease the incidence of “back labor,” up to 3 times less compared to those who experienced back pain without chiropractic treatment during pregnancy. These studies (and our experience) have shown that with chiropractic care, the average time until relief is felt is approximately 4.5 days after the initial treatment, and often even immediately after the first adjustment depending on the cause of pain. Another study found that significant relief was achieved with an average number of 1.8 treatments and no adverse effects of treatment were reported. A more recent study showed that chiropractic care also results in a reduction of meconium-stained amniotic fluid, preterm delivery, need for forceps, and cesarean delivery in women receiving prenatal adjustments. This can be explained by considering the alignment of the pelvis. When the pelvis is misaligned, it may reduce the amount of room available for the developing baby. This can restrict the fetus’s ability to move and shift as it normally would to prepare for delivery. This restriction is called intrauterine constraint which can result in breech and suboptimal positions that increase the stress of labor and can lead to interventions such as forceps use or surgery (c-section), which can be dangerous for both mother and baby. Approximately 4% of all pregnancies result in a breech presentation. The rate of caesarean section births in the U.S. was 32.7% in 2013, well above the World Health Organization’s ideal target of 10 to 15 percent. The high rates of cesarean delivery should be of concern to those providing care to pregnant patients, especially considering the fact that chiropractic care has been shown to reduce the number of cesarean deliveries. With the pelvis in proper alignment following chiropractic care, babies have a greater chance of moving into the optimal position for birth, and the dangers involved with breech or suboptimal presentations can be avoided altogether. This balanced state in the pelvis has been clinically shown to allow for optimal fetal positioning during birth, allowing for shorter and easier labor, and therefore easier and safer deliveries for both the mother and baby. An increasing number of practitioners and obstetricians are aware of the benefits of chiropractic care for their pregnant patients, and the referrals for chiropractic care during patients’ pregnancies and labors is becoming more prevalent as there are substantial benefits (with no negative side effects for the baby) from chiropractic care during pregnancy. Our doctors use adjustment tables that adapt to a pregnant woman’s body, and use techniques that are gentle and avoid unneeded pressure on the abdomen. The increased ligamentous laxity brought on by pregnancy hormones (along with our tables that form to the mother’s body) allow the patient to relax in comfort. The adjustment requires only the slightest force to safely and successfully correct misalignment and fixation in the spine and pelvis. At no time do our doctors attempt to directly change the position of the fetus, as is done with external cephalic procedures; our doctors simply correct pelvic alignment to alleviate potential causes of intrauterine constraint.